It’s always nice to see significantly older cars out on the road, and they’ve been such a rare sight for many years that they have nearly the same visual impact as a modern exotic, for much less money. Needless to say, you won’t be getting to 60 in 3 seconds, or doing 200mph, but who does that anyway, outside of the context of a race track? 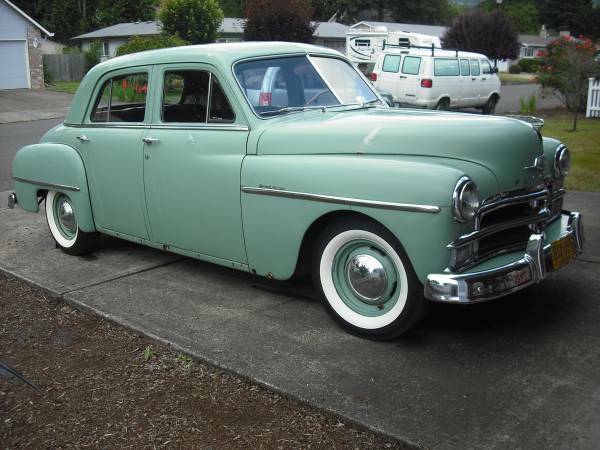 Simple, reliable, and drivable, early 1950s American cars have the charm of a country just waking up from putting everything on pause for the sake of the war. 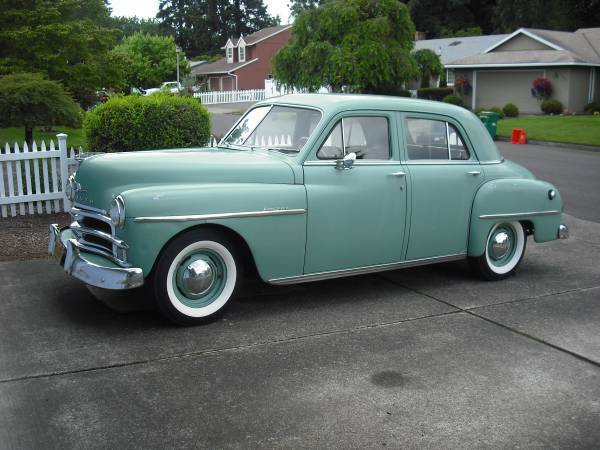 Check out this 1950 Plymouth Special Deluxe for sale for $3995 in Happy Valley, OR. Who wouldn’t be pleased with a car purchased in Happy Valley? These cars were largely the same mechanically as their pre-war predecessors, with a 218ci flathead six cylinder engine putting out 95hp. While that doesn’t sound like much, they will cruise comfortably at highway speeds and should have respectable torque – of course, the lack of hundreds of pounds’ worth of luxury and safety accessories also helps. The 3-speed manual will also help you extract the most out of the six. Sure, the styling is a little conservative, even frumpy. But look at the details – the great stainless trim, including the grill, around the beltline up onto the rear window, and the art-deco Plymouth badge on the trunk lid, and the sailing ship hood ornament. The interior is equally charming, with a great dash the seller has unfortunately not shown. After being off the road since 1999, this car was treated to new whitewall tires, battery, starter solenoid, rebuilt carburetor, and brake light switch. 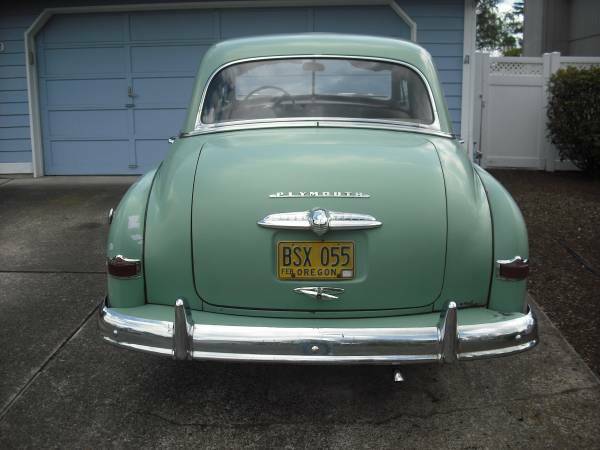 The seller suggests the car is worthy of restoration or driving as-is. With values of these cars being where they are, you’ll probably have the most fun with this car just using and enjoying it, and not worrying about the odd scratch or ding. Focus on the mechanical side, and you’ll be contributing to the survival of this piece of history while not spending a significant amount of scratch. This entry was posted on August 15, 2014 at 5:22 pm and is filed under Uncategorized. You can follow any responses to this entry through the RSS 2.0 feed. You can leave a response, or trackback from your own site. Seems a good deal, especially if it’s not rusty or rat chewed.